Rayaan Bawa is the first baby born to a Moosomin couple in 2018, at 1:15 in the morning on New Year’s Day. He was born to Mehak and Abhinav Bawa. Above is the couple with their new baby and their cat Romeo. 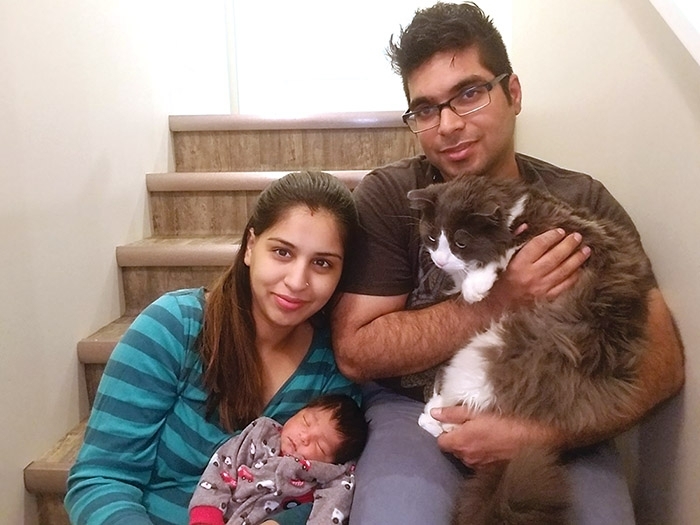 When Mehak and Abhinav Bawa were told that the due date for their first baby was New Year Day, the Moosomin couple was thrilled. That’s because there is a special significance for that day in their family. “The coincidence was that my mom, she had my brother on the first of January as well, so it was very surprising for us,” says Mehak. However, as with most pregnancies, there was no assurance the baby would come on the due date. But on Dec. 31, Mehak says she began to have contractions. Not sure if they were contractions or not, she didn’t say anything to her husband until her water finally broke. The couple went to the SEICC in Moosomin, but were sent to Brandon where the baby was delivered at 1:15 in the morning on New Year Day. They named their son Rayaan. Not only is the baby their first, but is the first grandchild in the family. They were overjoyed, along with their families. “My mom was really excited, she said we made a record because I had my son on the same day and you had yours the same day, so we can have a double party on New Year’s,” says Mehak. The couple has been living in Moosomin for two and a half years. Abhinav works at Seed Hawk as a production technologist. Abhinav moved from Toronto to live in Moosomin and work at Seed Hawk, and Mehak moved from B.C. The couple came to Canada from India to study in Canada. Mehak has her criminology diploma Abhinav has an engineering diploma. The couple have settled in well with their new baby, and credit their cat Romeo with helping them get ready for the responsibilities of parenthood. “We got our cat about two years ago,” says Mehak. “We had just gotten married, and we were lonely because we don’t have many relatives here. I was the one who wanted to have a kitten. My husband was not sure if we would be able to raise it. We were never around pets. Mehak says Abhinav took lots of responsibility for their cat, feeding him and taking care of him regularly. “Now that we have a baby, it’s very convenient for me because in India most guys, they don’t want to change a diaper,” she says. “But my husband said it didn’t bother him, he was going to change a diaper, and he was not feeling icky or anything (because he had helped with the cat). “He’s like our first baby, and we even called him Romeo Bawa,” she says with a laugh. Rayaan Bawa was born at 1:15 am on Jan. 1, 2018 and weighed 7.5 lb. Proud grandparents are Rashmi Bawa and Jaswinder Bawa, and Reeta Setia and Pawan Setia. Proud uncles are Sanam Setia and Kanav Bawa.